Posted in: Uncategorized. Tagged: blogspot, Guild Wars 2, MMOs, video games. 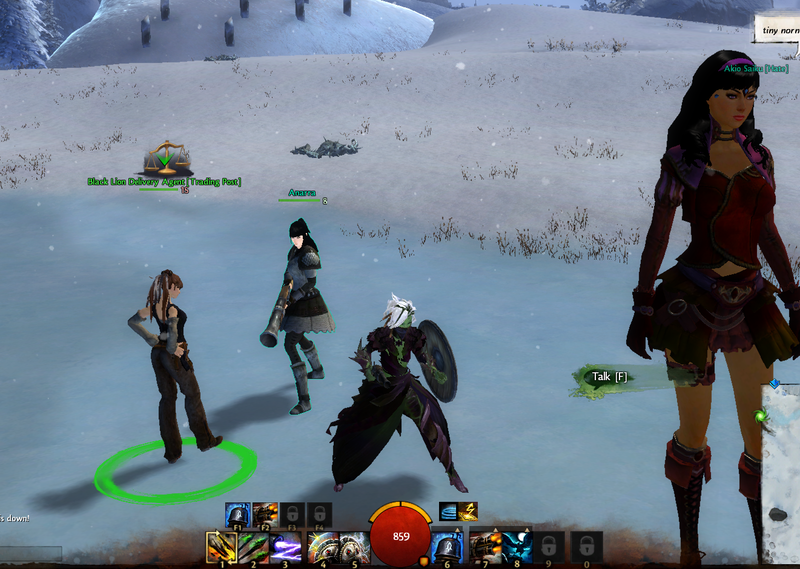 Last weekend was the second Beta Weekend Event for Guild Wars 2, so I spent most of the weekend playing it. 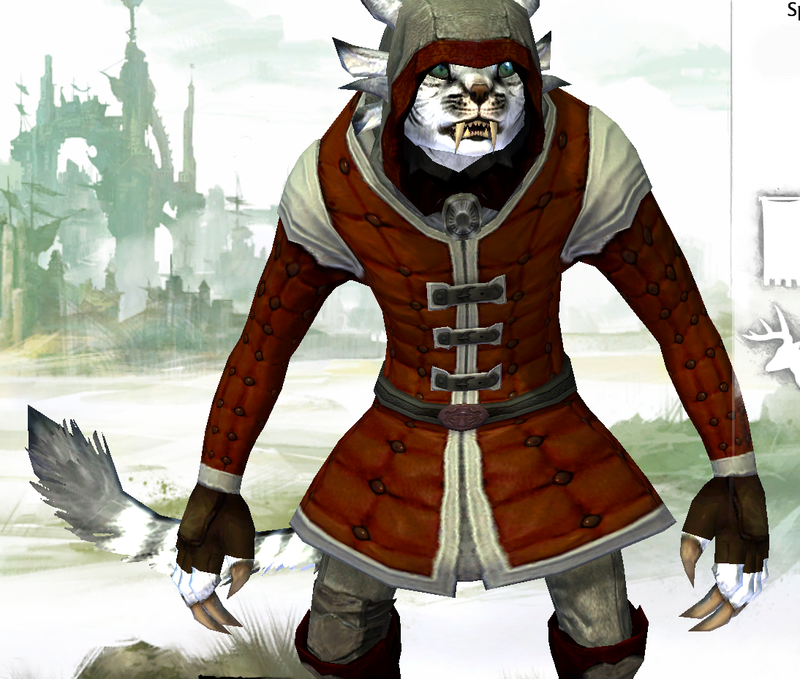 I already had a Charr thief I’d made for the last beta event, but I made a couple of other characters, a Norn engineer and a Human necromancer. 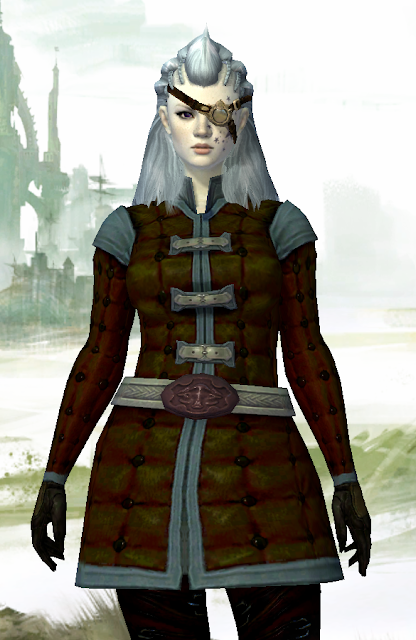 I ended up mostly playing the engineer because I really enjoyed the class and the Norn starting area. The thing I’ve found so far is that each class allows for a fairly wide range of playstyles while each still keeps their own unique flavor. The engineer uses pistols, rifles and shields, and has a wide range of utility skills from turrets (some for healing and some for damage/control) to grenades to elixirs (providing buffs to the player and/or nearby players). I highly recommend playing quite a bit with different skill/weapon combinations because it really changes how the class plays. I did some crafting – leatherworking and huntsman on my engineer. Leatherworking is pretty much what you would expect, crafting various forms of medium armor and inscriptions to buff said armor, while huntsman is mostly for ranged weapons. The crafting system is interesting – once you choose your crafting professions (you can have two) you gain some basic recipes. You skill up by crafting things and you learn new recipes through either (rarely) purchasing them from vendors or through discoveries. On the crafting interface there is a tab for recipes and another tab for the discoveries, where you select 3 or 4 components to craft something and ‘discover’ a new recipe. It’s fairly obvious what items you need to craft for a discovery. For example, for a new pistol discovery I put an inscription and the pistol components together, which created an upgraded version of the pistol recipe I already knew. My only issue with it is that my huntsman skill progressed much more quickly than my leatherworking, because I had trouble getting enough leather to craft the things I needed to improve my skill. 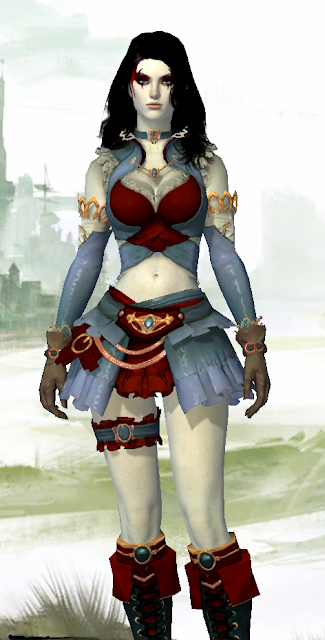 So while my huntsman crafting skill advanced ahead of my gear level, my leatherworking lagged pretty far behind. Still, overall I found the crafting system fairly enjoyable. It is grindy but not tediously so (at least for me). I might post some more thoughts later, but for now, have some screenshots. 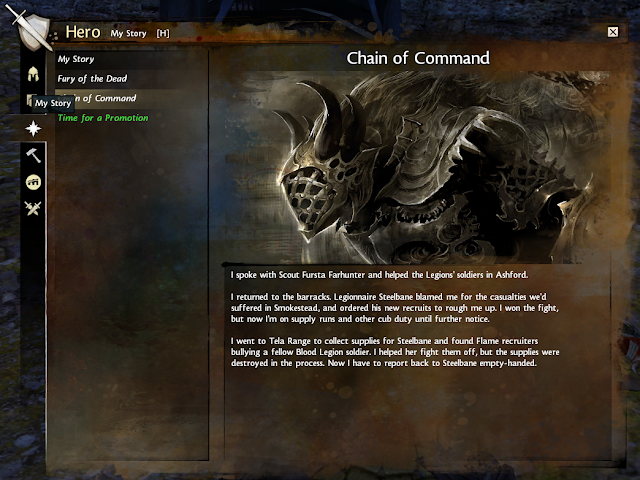 I thought this was actually pretty cool; as you progress through your character’s story quests, there’s a story tab on the character sheet that records your adventures. The above is from one of the quest conversations between a couple of Charr NPCs. 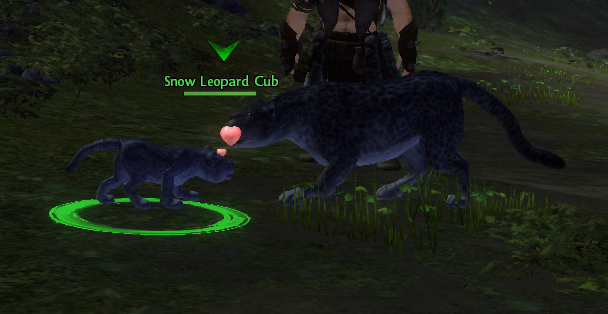 This was from one of the Norn starting area quests – your character is transformed into a snow leopard and you’re supposed to play with the cubs and do some hunting. It was adorable and fun. 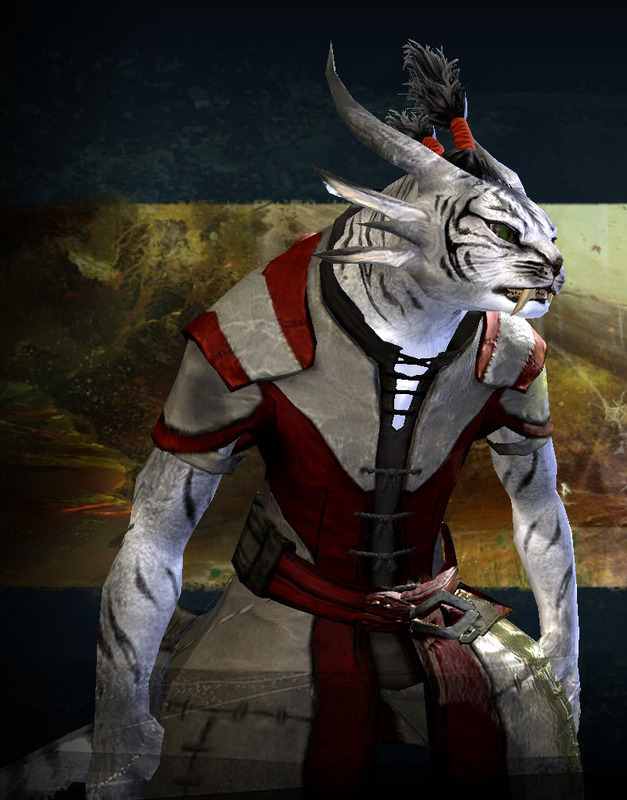 There are three types of skills for combat: weapon skills, slot skills and traits. The weapon skills unlock as you use a weapon; it doesn’t take very long to unlock all 5 skills for a specific weapon combo. Slot skills require you to spend skill points on them which are gained either as you level or through doing skill challenges. 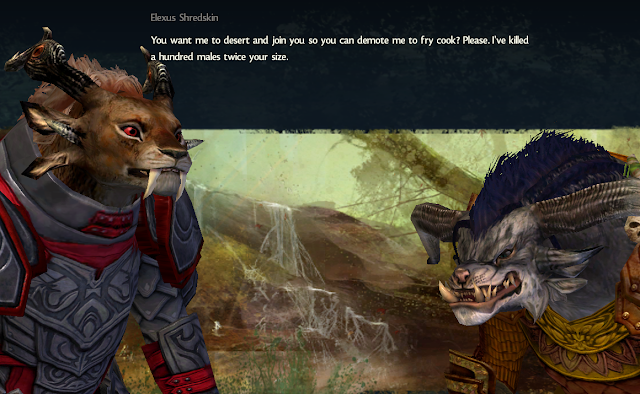 The NPC in the screenshot above offered a skill challenge of beating him down, which was no problem for my mighty Norn. 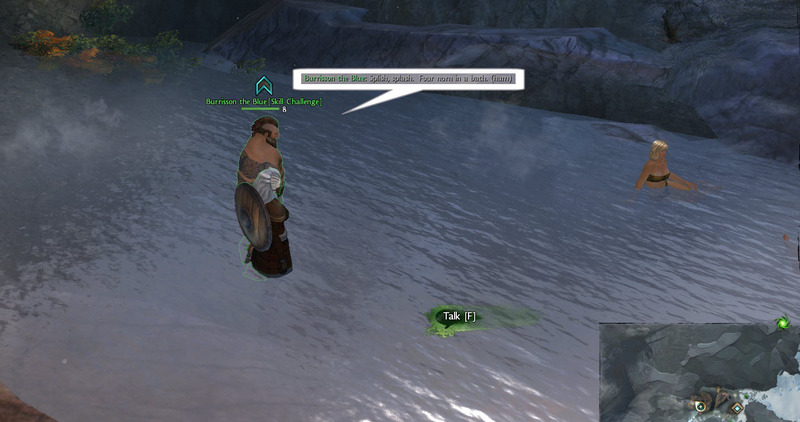 As I walked up to him (he’s in a hot spring pool with 3 Norn ladies) he said “Splish splash. Four norn in a bath (hum).” So of course I laughed and grabbed a screenshot. Slot skills give you your utility skills; for the engineer those are things like turrets and grenades and elixirs. Oh, and trait skills are unlocked as you level up, you get your first point to spend when you reach level 10, I believe. Trait skills boost your other abilities – I was putting points into firearms on my engineer, which increased her effectiveness with firearms and after 5 points would unlock a bleed effect. 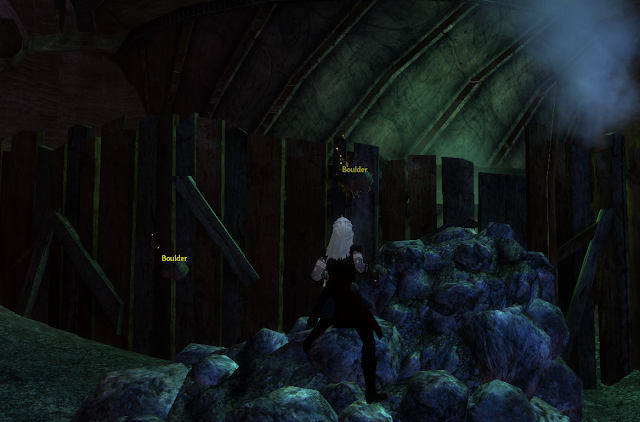 I can’t play a game without finding some bugs… my character is standing in a pile of rocks which can be picked up and thrown, unfortunately they landed somewhere a bit above the terrain. There are various places where there are interactables you can pick up and do stuff with. Aside from the boulders above, I saw snowballs (there was even a quest in one area to play with some kids by throwing snowballs at them, which have a knockdown effect), branches and planks. They really have a lot of interesting quest tech, I must say. After fighting a large nasty shaman as part of an event, a bunch of us hung out and partied with a “Box o’ Fun”, which had several transformation effects. 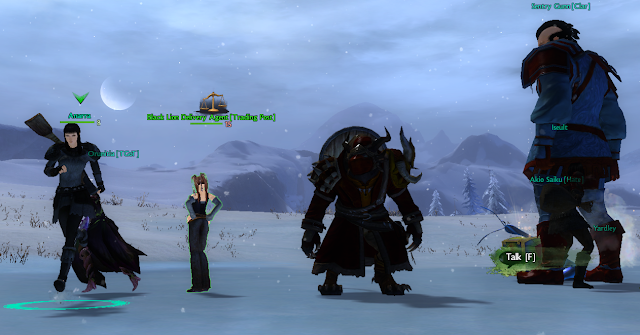 So my Norn got to try life as various other things for a bit. I didn’t really play the necromancer much. The necromancer has an interesting transformation ability though; as you kill creatures it fills up the meter and once you transform into a sort of ghost form, the meter gradually depletes. You have a different set of attacks in ghost form. I think they get a lot of things right and I’m really looking forward to playing this when it comes out.